In the interest of supporting the pumpkin pie for breakfast platform, I wanted to update my fullproof pie recipe with a no-refined sugar version. I’ve tried this without any sweetener at all, and really, that’s fine if you roast your pumpkins to golden and your palette doesn’t require a sweet taste. Top it with a vanilla whipped cream (no sugar added) or a dollop of yogurt. I’ve also played with a maple sweetened pie. A half cup of that works well, too. Roasted pumpkin is so forgiving. The version I like best though is sweetened with our friend’s backyard honey, a nice companion to our garden grown pumpkins. Enjoy it any time of the day and often. This is an updated version of my go to pie recipe. Not used to working with whole pumpkins? See my easy breakdown here. Roll out your crust and place in a buttered, 9-inch pie plate. Refrigerate until ready to use. Squeeze any extra moisture from the pumpkin puree with your hands or an old cloth. In a large bowl, whisk eggs into the pumpkin puree. Whisk remaining ingredients in, until smooth. If you like, use an immersion blender for a super smooth texture. Bake at 350F for 1 hour in the center of the oven. Cool and refrigerate until dessert time. I had so much fun making grape jelly last week. A coworker left a giant bowl of grapes from her garden in the staff room and, after all the teachers had munched their fill, I offered (eagerly!) to take the rest home. Sticking to my philosophy of only canning free fruit, I’ve never had any grapes to play with before and was excited to try. To be honest, I’m a little scared of jellies. I’ve only ever made an apple spice jelly which included a long process (and me trying to sew my own jelly bag.) Oof. But! This was so easy! And the product was so absolutely delicious. I used this recipe, substituting the nameless grapes I was gifted. We rinsed the whole batch in a large colander and happily found that the grapes fell easily from the stems. (We found that we didn’t even need to remove all of the stems. These fell away easily during cooking and were grabbed by the food mill.) Immediately after cooking, I ran the grape mixture through the medium disc on my food mill. I finished by canning in my trusty steam oven on 212F and full steam for ten minutes. After measuring out for the recipe, I had extra pulp and liquid. Rather than do the scale up math (did I mention this was a late night canning project? ), I froze the rest of the juice. I’m hoping to make a fancy non-alcoholic drink for Thanksgiving. We’ll see how that goes! Check out my recent write up of my favorite wheat bread recipe here. Pairs well with jam, of course! We will now take a break in the non stop pie action and bring you a healthier way to celebrate berry season. Adapted from Blissful Basil‘s book, which I just discovered at the library, this crisp uses maple syrup to sweeten the berries a bit. With a protein and fiber packed topping, I’m thinking it will do for dessert with cream or breakfast with yogurt. Because I couldn’t let one day pass without opening my favorite pie book, I’ve spiced the filling similarly to Four & Twenty Blackbirds’s solid blackberry and blueberry pie. Make the filling. Wash and pat dry the berries. Mix all the ingredients together gently. Pour the berry mixture into a buttered baking dish. In a food processor, add half the oats and almonds. Blend until fine. Add the cinnamon, salt, maple syrup and butter. Pulse gently until mixed. Add the remaining oats and pulse only 3-4 more times to mix. Sprinkle the topping on and then bake for 50 minutes at 350F. PS. I’m really kidding about taking a break from pie. You really should never take a break from pie. In fact, you should make this very delicious blackberry cream pie I worked up. Based on a few of my favorite different recipes and using this coffee cake crumb topping, it’s just another great way to enjoy our bountiful berries. This non-recipe recipe is a summer mainstay for me. 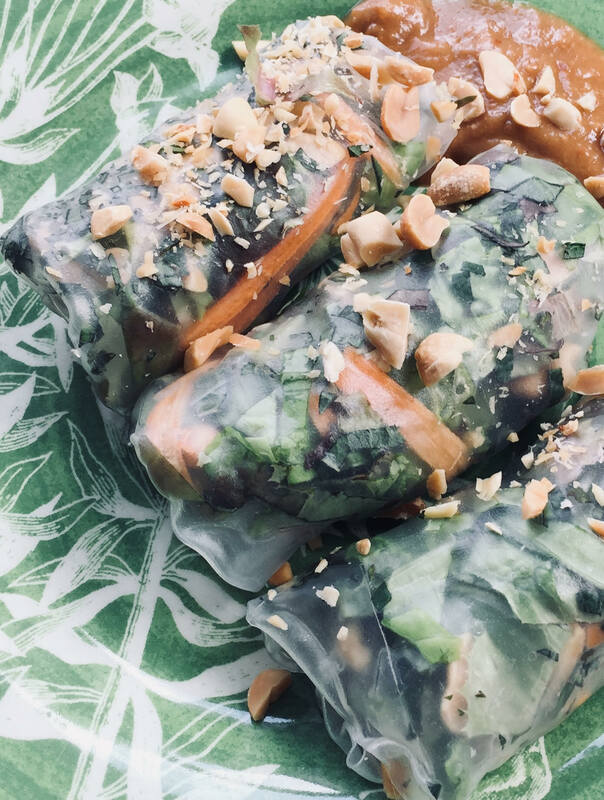 When greens are abundant and there are lots of good things coming out of the garden, salad rolls are especially fun to make. 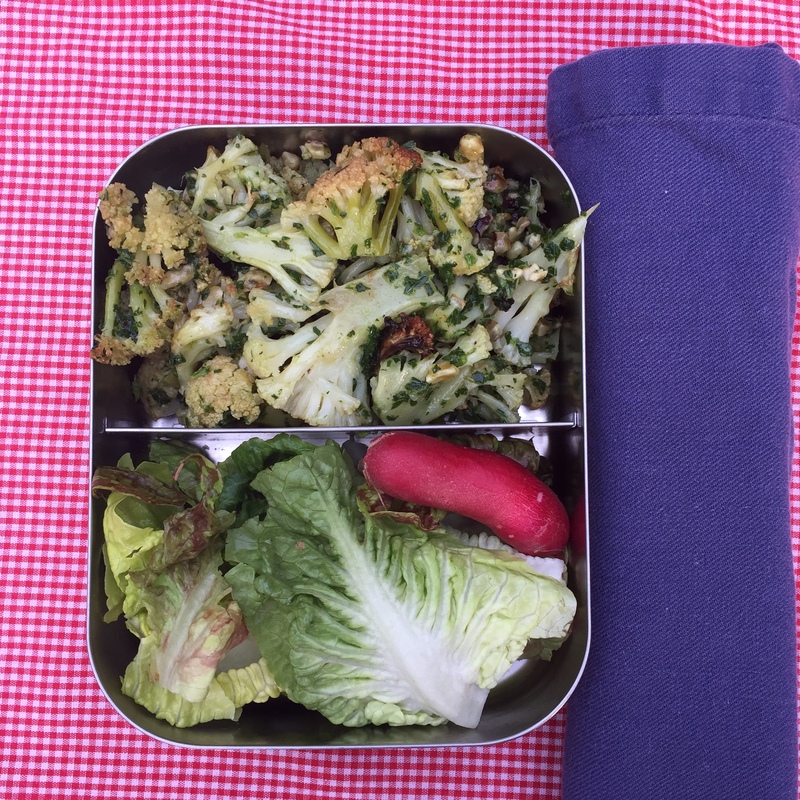 It’s a healthy option for lunch (and tastes extra refreshing when packed up and taken to a hot picnic.) I like to add the crunch of peanuts or sesame seeds to make it feel like a complete meal. If you want, you can also cook up rice noodles and, when chilled, add them to the rolls. Salad rolls are also a good way to use bits and pieces of leftover vegetables or protein that you may have prepared for another meal. Good stuff! I’ve seen kids (who won’t go near a salad in a bowl) devour salad rolls when they can dip it in this peanut sauce. It’s a mystery of childhood – why lettuce suddenly becomes appealing when it’s rolled up. Kids also like to roll their own and pick their fillings. If you prep your ingredients ahead of time, summer abundance and salad rolls can be a good excuse to have a party. Chop a lot of veg. Soak the wrapper in warm water briefly and roll it up. Make some magic peanut sauce for dipping. Heat oil in the bottom of a small saucepan. Toss garlic for a few minutes until fragrant. Add the rest of the ingredients to the pan and whisk. Cook over medium heat until visibly thickened, about 4-5 minutes. Whisk well. Cool. So, I couldn’t get this cake out of my head and I gave it a try. 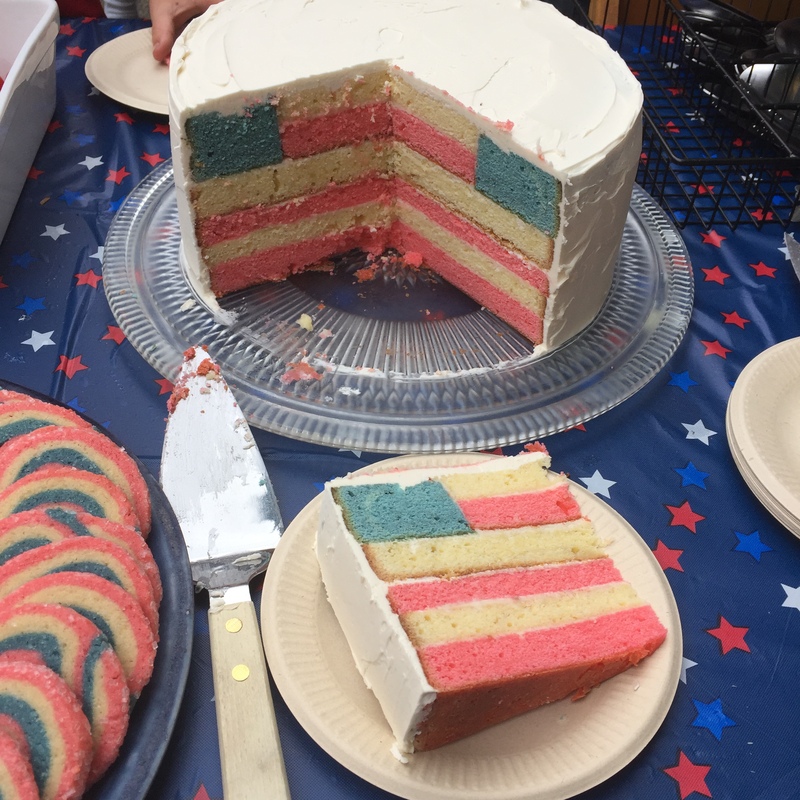 Two days later, we had a cake that made the group of kids gathered around the picnic table cheer when it was sliced open. What fun! I used this recipe, though I had to take my own notes and draw a diagram to understand the layering. I contemplated a lot of different white cake recipes, playing the ‘how many eggs do I have and does it use’ game, but in the end, I’m really glad I went with this base. It was a little delicate to work with, but the flavor was outstanding. The stripes were made possible by this inexpensive, amazing tool. I frosted it with the vanilla bean buttercream from Tom Douglas’s Dahlia Cookbook. The recipe can also be found here – double the amount, using four egg whites for just enough to fill and frost the cake. 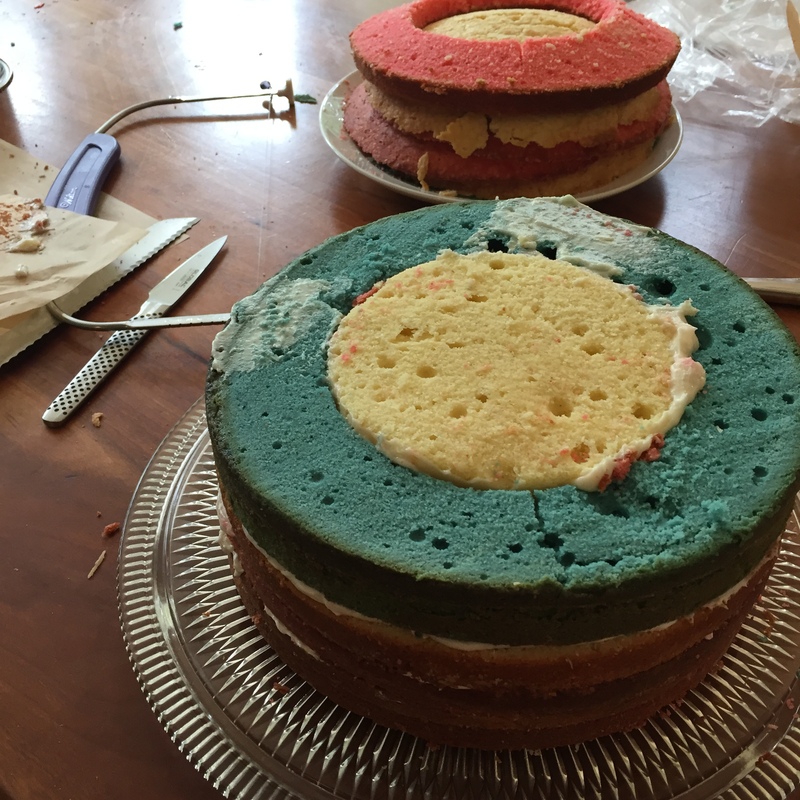 It’s basically a layer cake with a tricky top layer. Using a bowl to cut out a small circle, I swapped in one red and one white half layer into a ring-shaped full height blue layer. There was a lot of left over cake (thus why I had tried to find a different white cake recipe.) 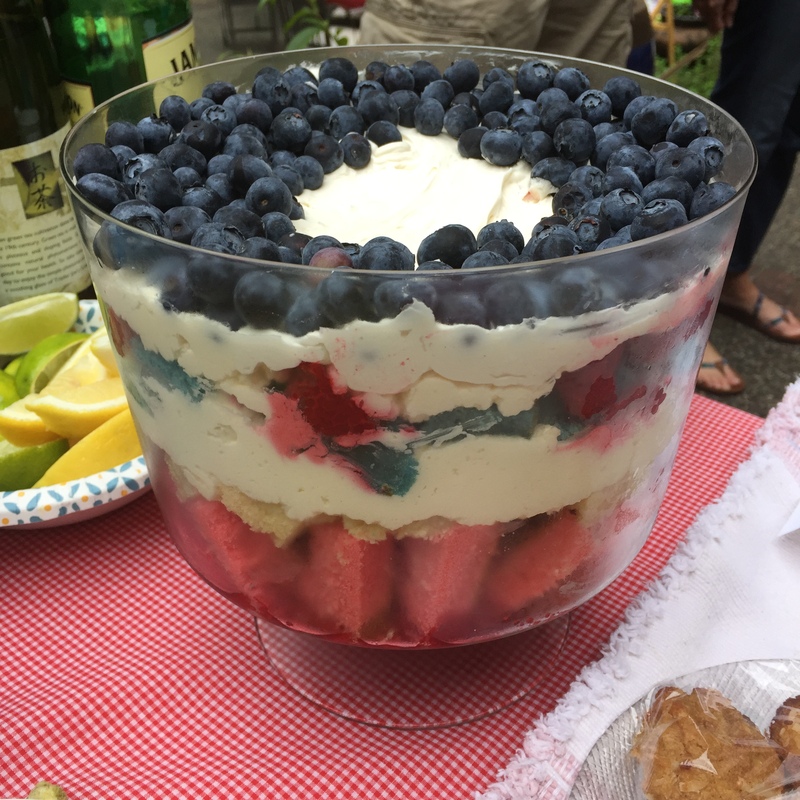 I used it to fake my way through a trifle, with whipped cream, amaretto, and berries. 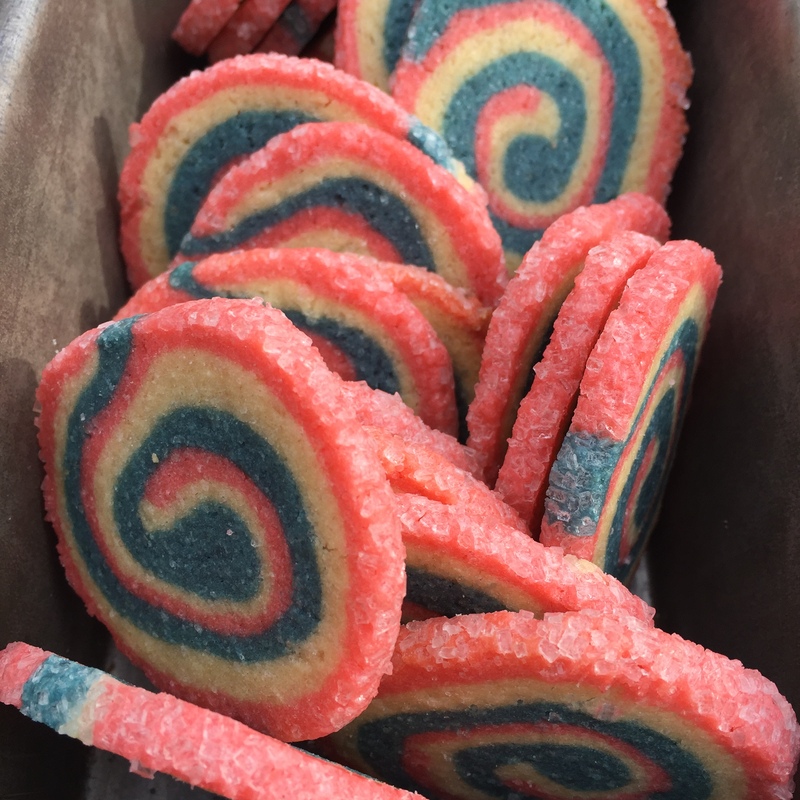 And just for good measure, there were also these sugar cookies… We might have gotten a little crazy with the food coloring. Perhaps next year, I’ll experiment with natural dyes. Here’s a good, quick picnic or potluck solution for you. I’m getting pretty excited about everything that is growing in the garden – it feels healthy and rejuvenating to have so much freshness. Markets are starting to bustle and our own garden is providing greens by the literal bucketful. Last week, we found a new favorite pasta dish. (I’m thinking about saucing beans with it too…) Have you tried this trick for kale? You dump a large amount of leaves in the boiling water, skim them out, and then drop the pasta in. Process with a little garlic oil and pasta water and you have a magically fast, green sauce. I have Six Seasons out from the library, and we’ve been having fun working through a few things. I love this book. So much good summer food and simple tricks. 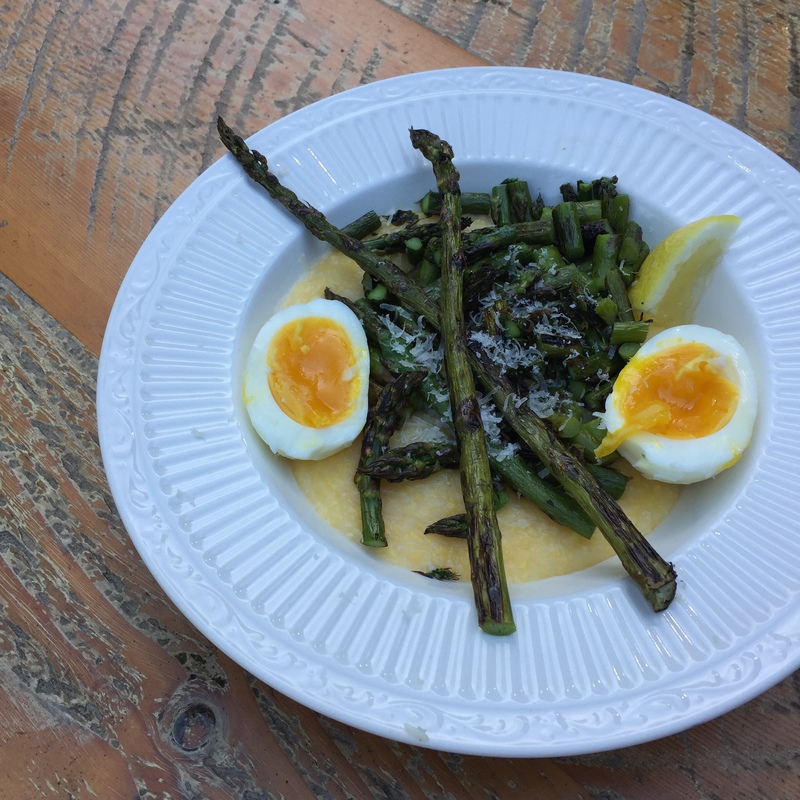 The author is in Portland, so the veggies are all aligned with our seasons. And bonus! When reading about him we found that he cooked at Franny’s, the source of another cookbook that we absolutely rely on. I’m getting pretty excited about summer food. There is so much green to be had – asparagus on the grill and snap peas on the side. There have been a lot of salads and a lot of radishes. What are you munching on? Here’s a list of cookbooks that I put together to help you get all ready for summer days and summer bites.